If you listen carefully you can hear it, the low bass rumble of hulking iron gears winding behind a cosmic curtain, beyond space and time. It sustains the universe, scaffolds reality. Once, when the machine was new, when it was well oiled and regularly maintained, it made little sound at all, just a gentle soothing hum that saturated the universe with newborn energy. But gradually, almost imperceptibly, the steady nearly-silent rhythm began to change. At first, it was just a tiny ping in the engine. Then the oil began to burn and the gears began to grind. Yet the machine continued to operate to specification, and the universe chugged along for another fourteen billion years. Then the ball bearings gave out. The machine started to crack and squeak, and the universe began to spoil. Stars began to lose their heat. Gravity began to lose its pull. Time warped and stretched like taffy. All the while that incessant squealing permeated the cosmos, driving men, women and beings of indeterminate gender mad. Finally, the timing belt snapped and the whole thing unravelled. There was a crash, a thud and the machine simply stopped running. Reality wavered. Faded. Disappeared. 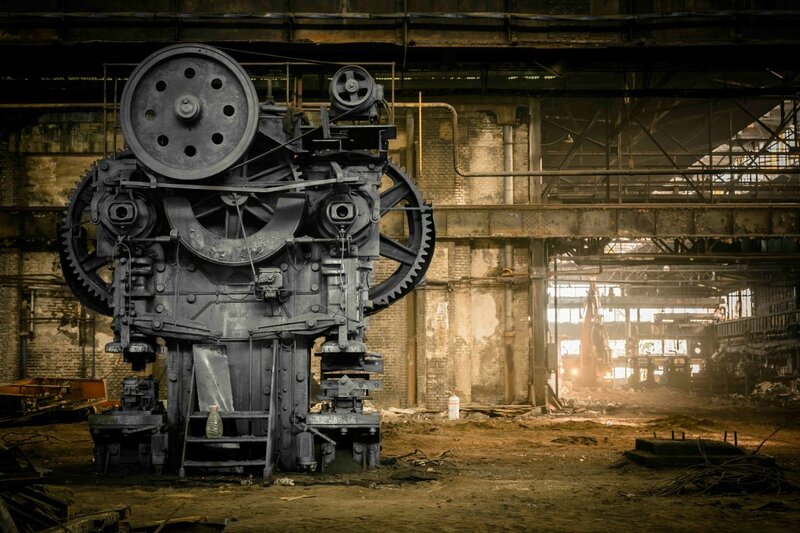 For ages the machine sat in disrepair, silent and still, ruined and forgotten in the darkness outside creation. Then its maker stumbled onto it while seeking parts for another project. He considered leaving it, for he was a busy man. But nostalgia seized him, and he was overtaken by an unexpected sadness. He toiled in endless dark. He replaced the timing belt and the ball bearings. He lubricated the sensitive inner workings. He filled the reservoir with a fresh carton of oil. When at last he was finished he flipped the switch. The machine spun to life, and the universe was new once more. And in the background, permeating space and time, was that familiar, ever-present hum. Cool writing. That engine in the photo looks like it could be a character in a Hayao Miyazaki film. Thank you 🙂 I actually haven’t seen anything by Hayao Miyazaki. Are his films good? Anything you’d recommend? Princess Mononoke, Spirited Away, and Howl’s Moving Castle are all worth watching, unique animated films. Someone on Facebook recommended the book “Howl’s Moving Castle.” I didn’t realize it was also a film.